Universal Shredder is an extremely easy to use, safe and reliable way of keeping your PC clean. It's loaded with some excellent features, such as Simplest in use, just one Click and everything is clean, Browser cleaning, Chat Messengers log cleaning, Temporary and Unused files cleaning, Cleaning Scheduler, File Shredder and Cookie Browser, that will assist you to maintain your PC strictly Private as well as clean. 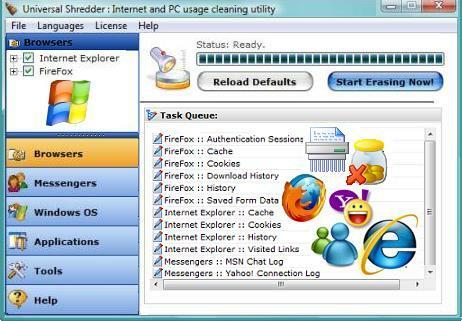 Universal Shredder is an extremely easy to use Internet and PC cleaning utility. - Not all Browser Cookies are Good and Ethical! - Deleting a File/Folder in Windows OS is not really "Delete" action! Any undelete tool can recover them. Shred them. - Wondering where your so much of C Drive Free Space gone?? Universal Shield 4.2 easily hides, protects, and encrypts your important data! The fastest soccer management game available today for mac and pc platforms. Qweas is providing links to Universal Shredder 2.356 as a courtesy, and makes no representations regarding Universal Shredder or any other applications or any information related thereto. Any questions, complaints or claims regarding this application Universal Shredder 2.356 must be directed to the appropriate software vendor. You may click the publisher link of Universal Shredder on the top of this page to get more details about the vendor.